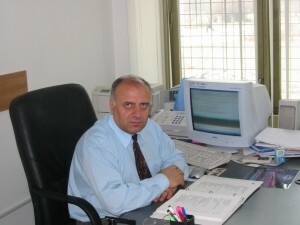 Professor George Stanciu gained a PhD degree in Technical Physics from Romanian Superior Diplomas Commision in 1981. His Ph.D thesis was in the Laser Scanning Microscopy field: instrumentation and application. Starting with 1973 he has been working in the Laser Scanning Microscopy field. In 1977 his team reported the first Digital Laser Scanning Microscope: (System for investigation of the semiconductor devices and the integrated devices by using laser scanning microscopy, G.A.Stanciu and C.M.Stoichita, Bul. Instit. Polit. XXXIX, 4, pp11-14, 1977). The system was the subject of Romanian patent no. 995574 (System for studying semiconductor materials and semiconductor devices -1978). After 1980 he built several types of laser scanning microscopes and used them especially for investigations on semiconductor materials and devices. In 2002 he founded Center for Microscopy- Microanalysis and Information Processing as a Multi Users Research Center . He published more than 100 papers in laser scanning microscopy, optoelectronics, applications and developments of confocal laser scanning microscopy and scanning probe microscopy. From 1995 he is Senior Member of the IEEE.